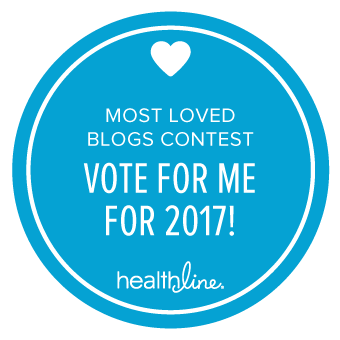 Healthline have launched their Most Loved Health Blogs Contest for 2017 and EMLWY is participating alongside a list of wonderful bloggers who write about a whole range of health topics including endometriosis. Voting is now open and closes on Wednesday 6th December 2017... And you can vote more than once if you so wish! I would absolutely love it if you could just spare a moment to vote for EMLWY. It's 6 years old now and, although it started off as a personal blog, a place for me to vent all my frustrations, I've worked really hard over the years to make it a place for anyone with endometriosis to come to and find some support and to learn about the disease. I'm up against some tough competition and I don't expect to get anywhere close to winning, but if every person who reads this votes then I would truly be grateful! You can vote here or by clicking the voting button on the right of the page (just scroll down a bit! ), and all you have to do is enter your email address. Healthline won't spam or sign you up to anything. It's also completely anonymous so I won't see who has voted... So, if you don't want to vote - don't worry! You're under no obligations to do so! Thank you in advance.... And please, get voting!